CAIDA continues hosting the annual "Active Internet Measurement Systems" (AIMS) workshops to promote discussion between academics, industry, policymakers, and funding agencies on active Internet measurement, and exchange of research ideas and questions that have been answered, or could be answered with proposed measurement infrastructures. From February 10-12, 2016, CAIDA will host the 8th workshop on Active Internet Measurements (AIMS 2016) on the UC San Diego campus in La Jolla, CA. AIMS 2016 is by invitation only. We have received an overwhelming response of registrants interested in attending, but as seats are limited, we have reached capacity and are no longer accepting new registrations. For information on Local Arrangements / Getting to UC San Diego, see the bottom of this document. (2) how different parts of the ecosystem (application developers, ISPs) can benefit from a combined effort. The workshop will run for 2.5 days (half day starting from Wednesday afternoon, two full days Thursday and Friday) with ample time for interactions between participants, breakout sessions, and collaborative discussions. CAIDA, in cooperation with CSU, USC, FORTH, Route Views, RIPE NCC, is organizing a BGP Hackathon to be held on the 6-7th of February 2016 at UCSD, the weekend before the AIMS workshop. The theme of the hackathon is live BGP measurements and monitoring. We will provide the participating teams data and a toolbox which include access to live streaming BGP data, the new BGPMon interface, BGP processing tools and APIs, the PEERING testbed, visualization tools, and data-plane active measurement platforms. join us and come over to hack! Participants have 10 minutes to present, and 10 minutes for discussion. Phillipa Gill (Stony Brook University), One Pi to Rule them All? For this workshop, attendees are expected to make their own hotel reservations and transportation arrangements from their hotels to the workshop. For CAIDA's list of local hotels including shuttle availability, see the updated Local Hotels list (PDF). Contact the hotel directly for hotel shuttle schedules (if available) to the San Diego Supercomputer Center (SDSC). This workshop is being held in the SDSC East Auditorium (Room B210E/B211E) that faces Hopkins Drive. General driving directions to SDSC are located on the CAIDA Contact and Visitor Info page. Shuttle to Hotels: SuperShuttle can be arranged to shuttle to UC San Diego campus or your hotel. Taxis: San Diego Taxi Information maintains a list of taxis with rates and additional information. Uber is also well established in San Diego and now has access to service San Diego's airport. GPSes will need to go to the intersection of Hopkins Drive and Voigt Lane. The nearest street address is 10100 Hopkins Drive, La Jolla, CA 92093. Car: Rental available at the airport near the baggage claim areas of Terminals 1 and 2. To park on campus, see Parking on Campus section, below. 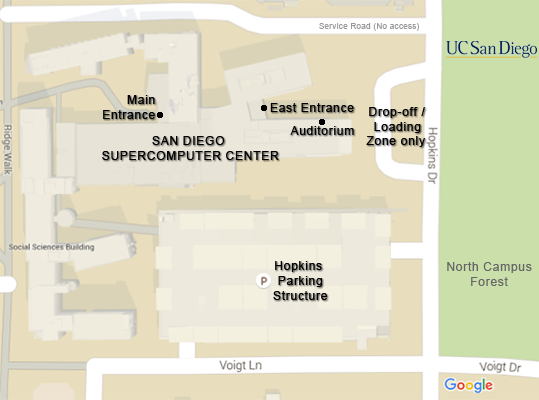 The most convenient parking is in the Hopkins parking structure at Hopkins Dr and Voigt Dr, just south of SDSC. Parking Permits: Parking permits are required to park on UC San Diego Campus. On arrival to campus on the morning of Day 1 from 8am-9am, check in with a CAIDA staff member at the driveway loop in front of the SDSC building on Hopkins Drive. Tell them that you are here for AIMS, and we will give you a parking permit for the day, and then point you to the Hopkins Parking Structure for parking. If no one is there, park in the 5 minute zone, head into the Auditorium to get a permit first. Otherwise, parking permits are sold at the kiosks in the structure for $16/day. Parking permits for subsequent days will be provided at the end of Day 1, just prior to the Reception. After picking up your parking permit, it is recommended you go to the Hopkins Parking Structure next to SDSC and park on the lower levels. Walk back to the street-side of the parking garage (level 2), and along the street to the SDSC East building. The auditorium is on the left just before the stairs, labeled Auditorium or B210E/B211E Meeting Room. For transportation concerns, general questions and help before the workshop, contact Cindy Wong at <cindy at caida.org>. General UC San Diego Maps and general UC San Diego Visitor Parking information are useful resources for navigating on campus. Funding for this event is provided by the National Science Foundation and the U.S. Department of Homeland Security Science and Technology Directorate.